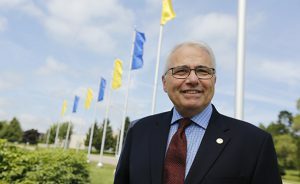 Raymond Théberge (PhD84) has been nominated to be Canada’s next Commissioner of Official Languages. Prime Minister Justin Trudeau (BA94) made the announcement on Thursday morning. Théberge currently serves as the President and Vice-Chancellor of the University of Moncton. Raymond Théberge (PhD84), who holds a PhD in Linguistics from McGill, has been nominated to be Canada’s next Commissioner of Official Languages. The announcement was made Thursday morning by Prime Minister Justin Trudeau (BA94). President and Vice-Chancellor of the University of Moncton since June 2012, Théberge’s distinguished career as an educator and academic spans more than 35 years and encompasses a number of important roles with universities, associations, and governments, according to the biography on the University of Moncton website. A Franco-Manitoban by birth, Théberge will be the first official languages commissioner who is not from either Ontario or Quebec. Théberge has held a number of positions in post-secondary teaching, research, and administration between 1985 and 2003, including senior positions at the Université de Saint-Boniface and the Centre d’études franco-canadiennes de l’Ouest, his biography says. He is also the author of dozens of reports and publications on the themes of education, community, communication, culture, and economics. From 2004 to 2005, he served as Assistant Deputy Minister of the Bureau de l’éducation française in Manitoba’s Department of Education, Citizenship and Youth and then served as the Executive Director of the Council of Ministers of Education, Canada. He also worked as Assistant Deputy Minister of the French Language, Aboriginal Learning and Research Division in the Ontario Ministry of Education and Ministry of Training, Colleges and Universities. This is the second time the federal government has nominated someone to fill the post on a permanent basis this year. Heritage Minister Mélanie Joly had first nominated former Ontario Liberal MPP and cabinet minister Madeleine Meilleur earlier in the year – a choice that provoked swift and furious backlash, as it was perceived she was too partisan for the role. Meilleur eventually withdrew her nomination in June. If approved, and Opposition parties are already complaining that they have not been sufficiently consulted, Théberge will take over for Ghislaine Saikaley, who has been interim official languages commissioner since December 2016, after Graham Fraser stepped down following a decade in the post.